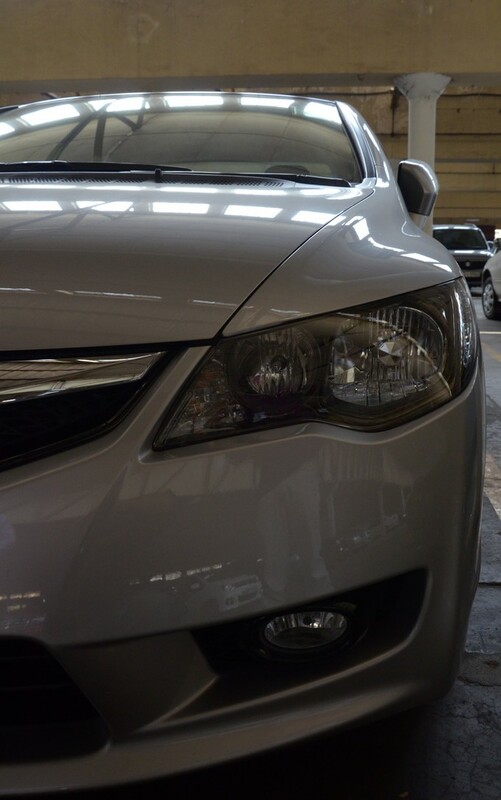 A colleague of mine purchased an FD3 Honda Civic Hybrid. The car was a reconditioned (used) in UK, and then imported into Sri Lanka. The chap had a long and very happy ownership history with a Honda HRV for almost 8 years, and had got very attached to the rather revvy nature of the CVT gearbox. Sadly the HRV an unique piece of Honda engineering was never continued, with the FRV dying a sad death, and the rather promising and direct spiritual successor based on the FD series Civic called the Crossroad discontinued abruptly in 2010 after just 2 years in the market. 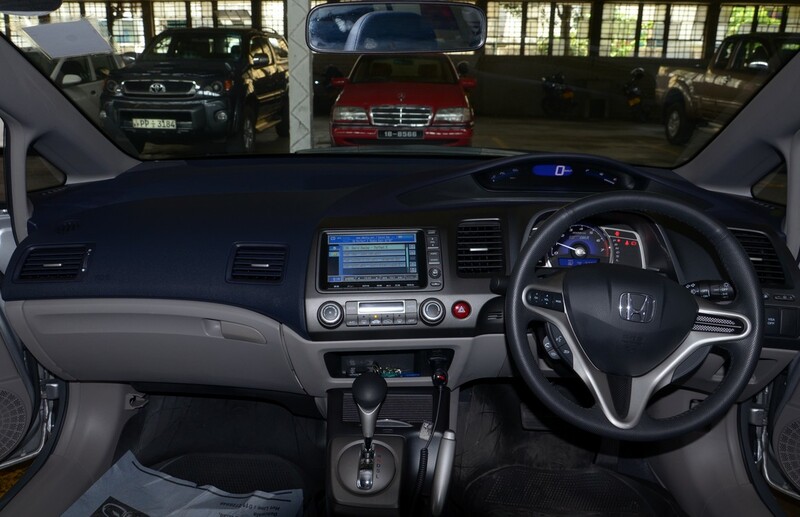 Hence the vehicle that met his budget and was from the Honda shed were the Insight and the Honda Civic Hybrid. The Insight was taken out for it rather quirky “rear end” (shared with the Prius), thanks to the designer going hell bent on aerodynamics and forgetting that cars also need look good all-around (the front of the Insight is really cool, the rear undoes the whole design). What can i say, looks pure FD Civic, and one would think this is the 1.6L Civic (single exhaust, the larger engines have the dual exhaust pipes), bar the blue tint on the headlights except for the giveaway pure sci-fi type alloy wheels. I am sure the alloys must be made of some super light material, but come on Honda what about the cool factor, it makes the vehicle look rather dull. Hybrid does not mean dull (Hint CR-Z Mugen prototype! ), the CR-Z for that matter has some cool wheels, and the normal Civic alloys themselves would have done good. Again not that different from the standard FD civic (which makes it uber cool with that lovely futuristic dashboard, just which my Stream had that digital speed indicator), though i feel the rear legroom has been reduced possibly to accommodate the batteries. I liked the seat material, and it seems the high quality (soft feel) Alcantra is standard across the range, nice. However not all the vehicles are of the same standard. The photos were taken from another office mates car, a car imported from Japan than the UK. 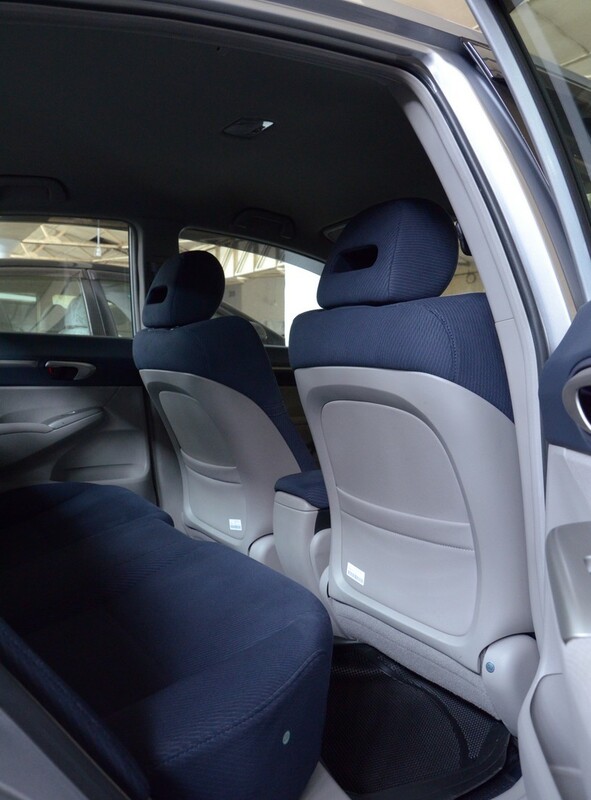 Here the Alcantra option is not available except on higher grades, and the material is more like you see in a standard Civic. Well i expected bog slow progress, and was i surprised. Though a 1.3L supported by a very small electric motor, the car accelerates quite decently, and this is an achievement considering all the non hybrid versions are far more powerful. In S mode the in gear changes are even more pronounced that for most it should be more than enough (I mean Toyota Corolla/Axio users, etc). The ride is also very compliant, that even non Honda buyers (Toyota buyers) should be seriously looking at this car, since it is over 40% cheaper in Sri Lanka than the equivalent Prius! The only quirk was the hybrid part, where you can hear a small motor sound as you brake (the owner indicated this was part of the hybrid setup) and the slight difference in feel to a normal car in breaking. The handling was in the same likes of a Civic (and a Stream like i drive). ****Will update once i get hold of the figures for other conditions. Unusually the car is very sensitive to driving style in peak (city) driving conditions. Aggressive driving seems to take the toll, and the best approach seems to be to take off slow, cruise and then break hard. This style ensures maximum use of the battery in cruise mode, and also maximum charge of the battery by harder breaking. Adjusting to this style may not be to everyone’s taste. One of my friend’s who owns the Civic Hybrid had to leave the country for over 6 months. He had left the car in the garage, and once he started to use it he noticed a that the battery no longer is able to charge to levels it did before. The normal charge capacity is 70%, but he now only gets 35%. When he spoke to many Hybrid service centers they confirmed that just like any battery if its not used the battery being a Ni-MH type the battery forgets. The easy and costly solution is to replace the battery, and he had been quoted Sri Lankan Rupees 350,000 (around US$3000) for an used battery with 6 months warranty. However another contact, supposedly who used to be the GM at Arabian Motors has said he can revive the battery, and also replace some of the dead cells and the cost of such would be around SRi Lankan Rs 150,000 (around US$1000). My friend who is also a major research type person has found the revival option has been known to be successful based on the Internet forums, and is hoping to pursue that. However the learning from this is a good one, don’t keep the car unused for long periods the benefit of the Hybrid battery reduces and also can be costly to revive/refresh the battery. If not for the concern over the maintenance and lack of warranty (since these are used cars brought from UK and Japan), the hybrid cars truly make sense, since the severe city congestion situations make the hybrid consistently return good fuel economies. The Civic and the Insight unlike the Prius attempt to keep some sense of driving feel, the Civic more than the Insight, which makes it a good alternative to to a petrol car. However if you can afford the diesels remain the top of the choice as they return even better fuel economies with no loss in power or overheads in worries such as battery issues. But for most specially in Sri Lanka where the duty on hybrids is lower than the equivalent petrol or diesel, Hybrids are very good alternatives, and hopefully we will see the agents or some aftermarket garages provided proper support to maintain and fix these vehicles. But if you really need power 🙂 and green, then its either the hopefully to be released Mugen CR-Z or the electric powered sports cars! Galaxy Tab2 10.1 P5100 For Quick SALE brand new condition, android 4.1.2 Jelly Bean updated. Carefully USED for few months. Still under more then 7months ETISALAT warranty. NOTE : Its not Chinese / Vietnam or Anycall clone version. Internal Memory 16GB, 1 GB RAM, SD Card upto 32 GB. Dual-core 1 GHz ARM Cortex-A9. A friend of mine, a long time Honda owner who moved away from Nissan, decided to upgrade his car and could not digest any car other than a CVT gearbox due to the rather revvy nature that is rather addictive (the very feel that the Toyota engineers invested so much to hide as they felt the Toyota client based wanted the normal auto feel). As a past owner of a CVT Honda Fit GD1, i can assure you that i really miss the Honda CVT revvy nature now that i am running a normal Honda auto gearbox equipped car. He was set on the Airwave, but found that the car was discontinued in late 2008, and there was a gap before the Fit Shuttle was released in 2011. But unlike the rather classy looking Airwave that looked so different from the GD Fit, the GE6 based Fit Shuttle has the same front end, but with the extended shell looks rather dull and boring (=ugly). Local car dealers always smart to pick such opportunities have boosted the prices of Airwave cars that they have in their inventory since the recent updated import rules meant only cars older than 2 years from present can be imported stops any further Airwaves coming into the market. Prices for a fully loaded Airwave (with the lovely moon roof) has sky rocketed that a Civic Hybrid is cheaper! 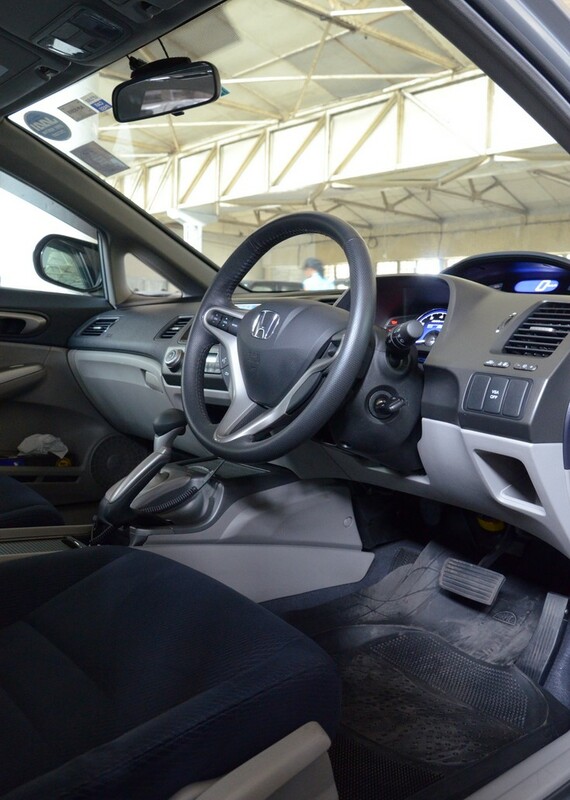 He then decided to go with an Honda Civic Hybrid since it too has CVT gearbox and also has luxury touch (not only in its looks, but also the Hybrid has the Alcantra seat covers even in the basic version) something which the Insight lacks. He was fearful of the Hybrid support in Sri Lanka and had gone and spoken to the head of the technical division at Stafford, who introduced him to a new hire, an Hybrid expert (graduate!) from the States working for Stafford, and also indicated that they had sent a technician to Japan and got him versed on Honda Hybrids. Honda Civic no longer to be made in the Japanese market! The classy and sporty option for the Corolla, Sunny users has always been the Civic. Aided by the uber cool Type-R and the somewhat simmered down but yet sporty SiR the Civic has always captured the hearts of motorist. The local motorist here also got access to the JDM only RS version which was a standard Civic with a bit more sporty suspension and external kit which though disappeared after the 7th generation Civic. The current (8th) generation Civic had such a futuristic design that it had Toyota delaying the launch of the Corolla to do some design tweaks, though that hardly made a difference as the Civic was a class on its own on the visual impact. However it seems that in its homeland the Civic has been loosing out, not to competitors but to its own siblings, and based on the reports the nearly similar sized Honda Fit, and the Civic based Stream being the major causes. However the Civic model will live on, as it still is a very popular car in other markets, and the new (9th) generation will be produced in the new Honda plant in Argentina. The question remains though is what will happen to the highly acclaimed Type-R sedan. While the European arm of Honda will surely develop a new Type-R hatch, the Japanese division were always one step ahead with an even more sharper and sporty sedan version. Hopefully Honda will retain a team to make this car and keep the sporty Civic sedan image alive. Just had to add this to blog ! However last evening i had this KL- registered Red Civic, with the RR badging which came alongside (I had it place as Type-R, but today my expert friend on local sport car imports confirmed that it was the Mugen RR – http://www.autoblog.com/2007/06/28/official-japan-gets-honda-civic-mugen-rr/, the ultimate front wheel drive sport car). Seems the owner of the car was keen to find out what my Stream RSZ was all about. Anyways this got me triggered and off we went on rather congested roads, the RR on the left and me on the right (or wrong, if you consider driving on the opposite side wrong) down bauddhaloka mawatha. I got the advantage of having the opportunity to weave through the traffic more easily than the RR, and kept clear two color lights thanks traffic and some “casual” overtaking. However the RR driver whoever it was, was a spirited chap and decide to follow the RSZ and show the true power of the RR. Turned into Stanley Wijesundra Mw, and though i had switched to sports mode and 1st gear, the RSZ was shown the power of the RR as it just burst past, and kept moving. The RR driver was still game as he definitely must have taken the foot of the accelerator as i started to close the gap at the end of the road as he turned into Reid avenue. I decided that i needed one more view of the RR and took the turn at full throttle, and went through traffic (again in a very “Casual” manner) catching the RR driver a bit off guard as he then floored to catch up. Somehow the RSZ remained ahead at the end of the road, as we turned into Thurstan road. However this time around the RR driver had decided that enough was enough, and must have worked out that the RSZ was not in the same power league, and was also an automatic 🙂 Once into Thurstan road, not just 20m in the RR just burst through and showed me a clean pair of heels, and with my destination being Thurstan Road, i gracefully turned to the lane with my brakes and mechanicals having more than a dose of burning rubber aroma! Two positives from that, one that the RSZ seems to catch the eye of even sporty drivers such as the RR, and that I was able to see the RR in its full glory, and had me wishing for an immediate change to a manual gearbox sporty sedan once more…. Message to myself – wake up, get back to the mature mode 🙂 To the RR driver good to see that RR (and a Honda) being driven the way it should be 🙂 and to see that buyers in Sri Lanka have taste and bring interesting vehicles, not just Allions, bulky SUVs and luxury sedans. However this car is planned for release in 2011, and possibly we might also see similar implementations from other vendors but considering the challenges GM faced in getting this implemented, its not going to happen soon. So back to earth, what are the options that we have in the Japanese market since the Sri Lankan industry is driven by used cars coming out from that market. The other new option that is starting to get popular is the new generation products from Hyundai/Kia.